REWIRING THE SOUL with Gabriella Kortsch, Ph.D.: Have You Laughed Lately? An apple a day...keeps the doctor away. How about a belly laugh a day makes life wonderful? Do you even remember the last time you had yourself a real belly laugh? The kind that made the muscles around your stomach ache? The kind that brought tears to your eyes? The kind that had you whooping? Maybe even snorting? I find that many of the belly laughs I have are actually directed at myself or at something I have done or thought or said. I used to tell the story of a trip I took to Rio de Janeiro in the 90's. 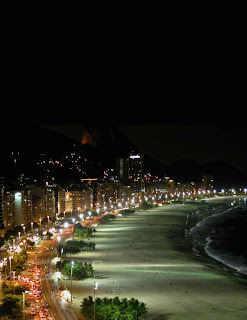 My hotel was perpendicular to Copacabana Beach, and from the balcony of my room you could indeed see the beach, so I was out there right after arriving from the airport, taking photos, and breathing in Rio. I looked at him scornfully and studiously ignored him as I took more photos. He kept on making signs, but he didn't seem to understand that I just wasn't interested. Not even to smile, or wave, or acknowledge his presence. This continued for four or five minutes, and he finally appeared to tire of my lack of interest, and so went back into the interior of his apartment. I, on the other hand, supremely superior to this mere mortal's fruitless signalling, slowly finished taking my photos and turned to go back into my hotel room through the French doors. They had locked. From the inside. I could no longer get into my room. I was on the sixth floor of the hotel on a noisy street. I looked around, but realized, no matter how loudly I might shout, I would never be heard by anyone down on the street. I looked longingly into my room at the phone on the bedside table. I gritted my teeth. I had no choice but to throw myself on the mercy of Mr. Big Belly whom I had been ignoring. I looked across the street to his balcony. He wasn't there. I continued looking at it fixedly. He was my only hope. I had to get back to my room. I had appointments, needed to shower, change, and get going. If he didn't rescue me, I might be out there until the maid came the next morning to clean the room. I looked across again. He still wasn't there. What would I do if he decided to exact revenge on my petty behavior? There he was! He had just come out. I jumped up and down. I waved. I felt like an absolute idiot. I had to get his attention. Finally he saw me. I gestured. I pleaded forgiveness with my hands. I mimed opening my door, and not getting in. I mimed a phone call, gesturing at him and down to the entrance of my hotel on the street level. He nodded. He went into his apartment. He came back out after an eon. He made a V for victory. I thanked him with my hands. And several minutes later the Housekeeper came into my room and opened the balcony door to let me in. I waved at the man in the shorts across the street and blew him a kiss. I've gotten a lot of mileage from this story. Most of the time when I tell it, I laugh so much at myself and my arrogance that day, that whoever is listening to it, laughs with me. Your belly laughs don't have to all be directed at you, but try and have one every day. It's great for your immune system, your blood pressure, your looks, your state of mind, it gives your body a great massage, and according to laughter therapists, it's just about one of the best things you can do for yourself.